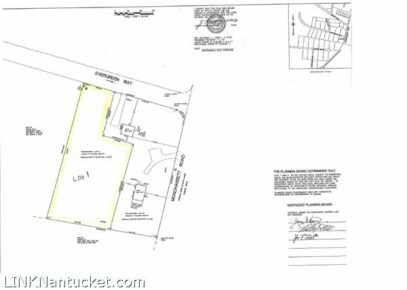 Build your Nantucket home and cottage on this rare one acre Land Court Approved Parcel. The property is flat with mature vegetation. Distant ocean views from a second floor. Property has 7% ground cover allowed which is approx 2800 sq ft on the ground which offers many possible design options to the buyer. There is town water available to connect in Evergreen Way and the buyer will need to install a septic system. Priced to sell!